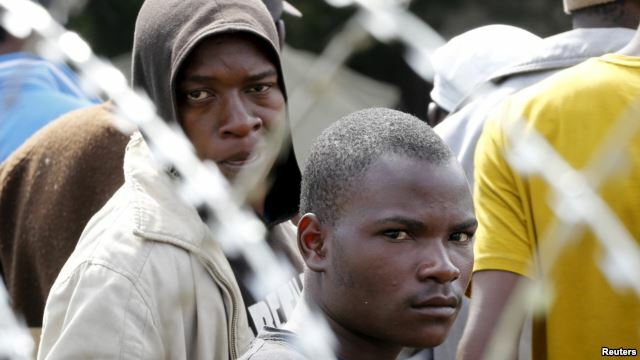 Corruption is pervasive throughout the asylum process in South Africa, according to a report published this month. Almost a third of asylum seekers and refugees have to pay bribes for correct documentation violating the Refugees Act that stipulates that they are not required to pay any fees for documentation. Rights groups say incompetence and graft within the Home Affairs department is contributing to the number of undocumented foreigners who have recently become the focus of a government “clean-up” operation. Asylum seekers and refugees experience significant corruption involving multiple actors, according to a report by Lawyers for Human Rights (LHR) and the African Centre for Migration & Society (ACMS). Based on anecdotal evidence collected from over 900 interviews with applicants applying at centres across the country, the report said that Refugee Reception Offices arbitrarily issue documents to asylum seekers and refugees looking to renew their documents. Corruption is most pervasive at the office in Marabastad, Pretoria with over two-thirds of applicants experiencing graft. If you cannot pay, rejection is almost guaranteed. Over half of respondents at Marabastad experienced corruption while standing in queues and a third were denied entry to the office because they could not pay bribes. Methods of extortion are evolving, says Kabelo Sedipane from Corruption Watch, a non-profit platform for reporting corruption. “Our undercover operations are revealing new types of corruption that we hadn’t taken notice of. This includes corruption such as people having to pay translators or translators putting price on the type of stories they can sell you so the more money you have – the better your story. If you don’t have any money [they say] ‘we’re going to tell a fake story,’” Sedipane said. When people are asked to testify against corrupt Home Affairs’ officials, they are often afraid of compromising their application or implicating themselves and withdraw the complaint. South Africa is one of the top global recipients of asylum seekers and received over 70,000 applicants in 2013 – similar to the number of those received in the European Union or United States. The large demand on the asylum system has allowed corruption to thrive but the number of refugees isn’t to blame, argues Loren Landau, researcher at ACMS. “The argument is that Home Affairs and the way in which it is dealing with immigrants and refugees is shifting from one that is based on law and based on policy to one that is based on profit,” he said. If they are arrested, they could be sent back to the countries from which they fled. Following a wave of xenophobic attacks in April, the government launched Operation Fiela – “sweep out dirt.” Described as an anti-crime campaign, rights groups say it is a populist policy feeding anti-foreigner sentiment. The majority of those detained during raids have been undocumented foreign nationals – including those eligible for asylum say LHR. “A quarter of the people detained during raids in June had rights to stay in South Africa – this included stateless people,” said David Cote who heads the Strategic Litigation Unit at Lawyers for Human Rights. “Access to Lindela detention centre remains a problem. By the time notice was given – people were being deported,” he said.